Plates contain virgin & recycled rubber (odorless, reduced noise, gentle on the floor). Free rack (200.00 value) included. Because all of our bumper plates are the same diameter, 10lb and 15lb are thin, and prone to bending or to be broken. The rubber used to make them is not like a stiff plastic. 260lb rubber bumper plates should be used like sandwich type, put 10lb and 15lb in the middle so as to thin plates can be protected. If you use 10lb or 15lb alone, you have to use a 15lb training bar instead of 45lb Olympic bar as thin plates capacity is 15lb only. IMPORTANT- These are rubber, but are not meant to be thrown around. Consistent abuse may lead to cracks or splits. Ship out 2-7 days. 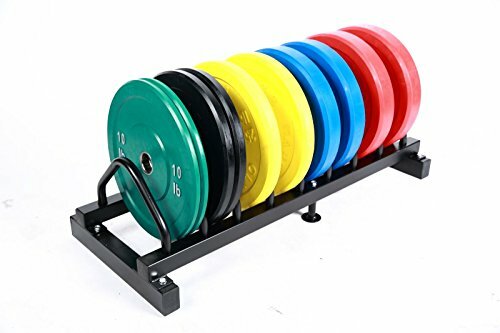 Bumper plate rack offers easy storage.